Quickie Summary: State “Trunk” Highway 70 cuts across northern Wisconsin all the way from Minnesota to just short of the Michigan line near Florence. Long stretches of forest, roadside lakes and rivers, recreational trails, the World’s Largest Penny, Snowmobile Capitals of the World, and an array of small towns and vacation destinations line the road from end to end. Truly an “up North” road all the way. Highway 70 in Minnesota becomes Highway 70 in Wisconsin at this bridge over the St. Croix River. At this point, you’re very close to the westernmost point in the state. The original bridge here was a toll bridge that opened in 1929. The western start on 70 entering Burnett County, in from Minnesota. Highway 70’s eastern end is in Florence County, which has neither cities nor villages… in fact, no incorporated places at all. 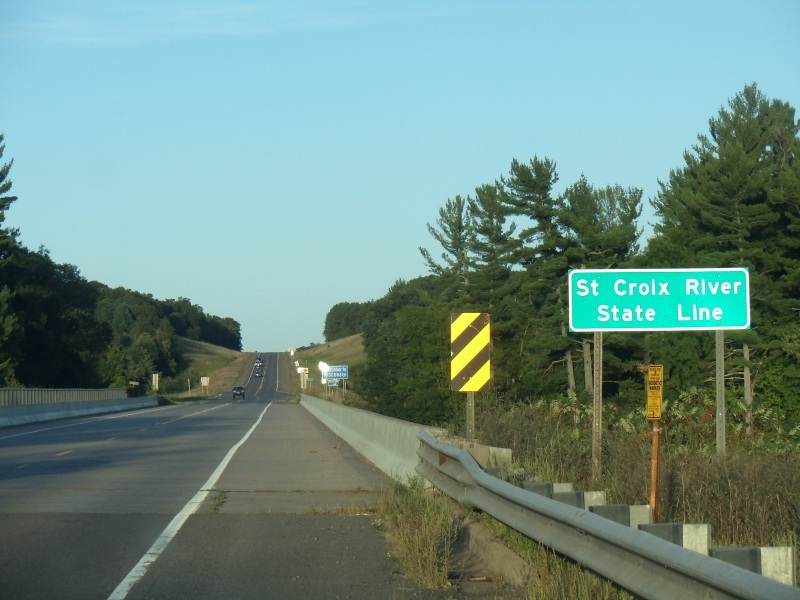 Numerous recreational opportunities abound along the St. Croix River, where you can have fun in two states at once. 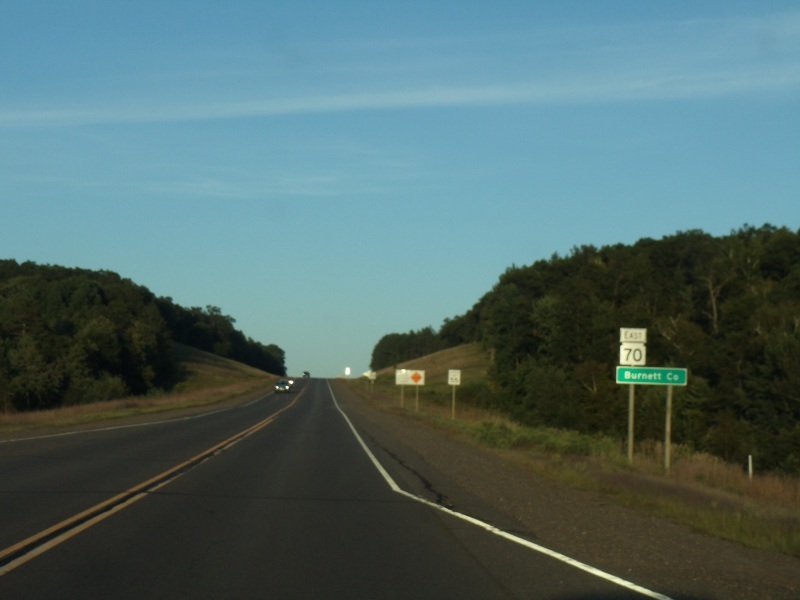 Highway 70 enters Wisconsin from Minnesota’s own Highway 70 over the St. Croix River and runs through a few miles of wilderness before entering Grantsburg (pop. 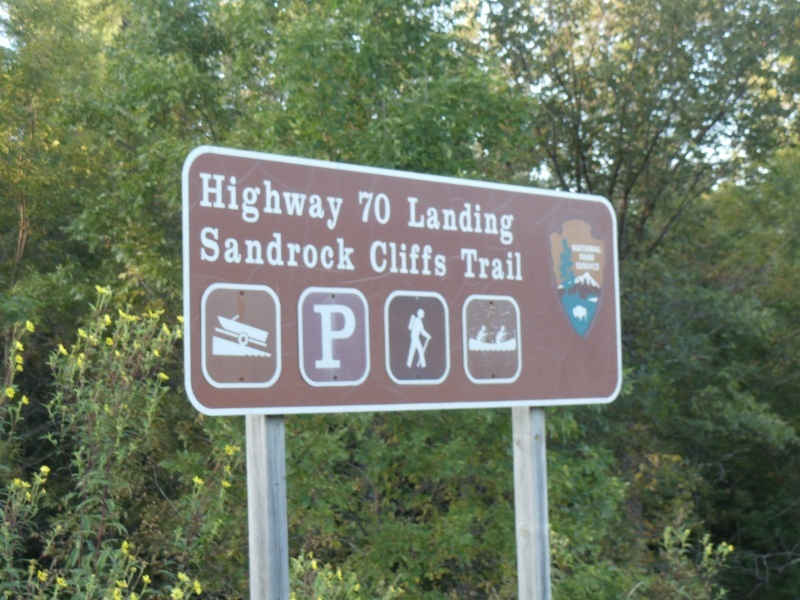 1,460), which bills itself as the “Gateway to Crex Meadows.” It’s also a key access point for the St. Croix National Scenic Riverway, a 200-mile corridor along the St. Croix and Namekagon Rivers that epitomize the beauty and recreational fun of the wild rivers up north. Crex Meadows is the largest wildlife area in Wisconsin, with over 30,000 acres, 270 species of birds and 600 species of plants. Crex Meadows started as a carpet company’s land, when the Crex Carpet Company bought 23,000 acres in 1912 to use for grass rug production. The company lasted until 1933, when the popularity of linoleum put them under. The “Crex” lives on in name with the wildlife area, the largest in the state and considered by the National Bird Conservancy to be one of the top 500 Globally Important Bird Areas in the U.S. Find out more about Crex Meadows here. Another major natural area is Governor Knowles State Forest, which runs like a path extending 55 miles long and up to two miles wide. It’s all about the nature up here. 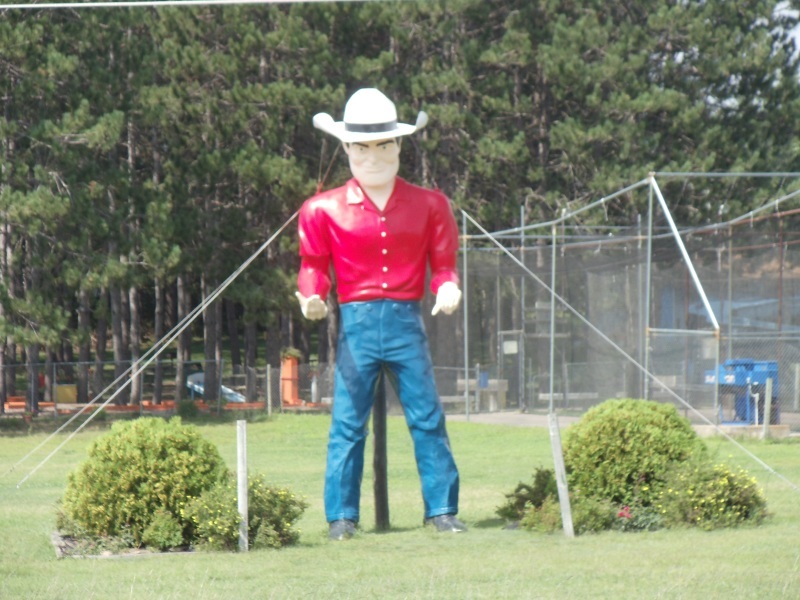 It’s also about tall people: “Big Gust” Anderson was a favorite son, towering 7 1/2 feet tall (unfortunately for him, before the days of the NBA – he died in 1926) and is commemorated with a wooden statue by the Community Center building (416 S. Pine Street) in Grantsburg. A stop at the statue will reveal the story he has to tell. A good stop if you’re hungry or in a malt mood is The Drive-In, a classic burgers, fries, and malts joint that evokes the 50’s – in part because it opened in 1956. 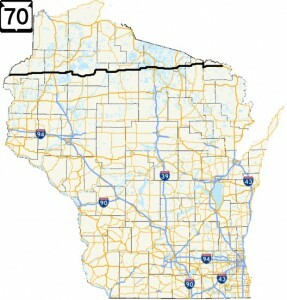 In Grantsburg, Highway 70 meets the northern end of Highways 48 & 87, and then heads east across the northwestern Wisconsin wilderness. Next up is Siren (pop. 988), originally named “Syren” after the Swedish word for “lilac.” Siren is the county seat of Burnett County (having moved there from Grantsburg in 1982), a popular vacation home area for Twin Cities residents and features a local farmer’s market as well as a series of festivals, including a spring one saluting the lilacs it was named after. 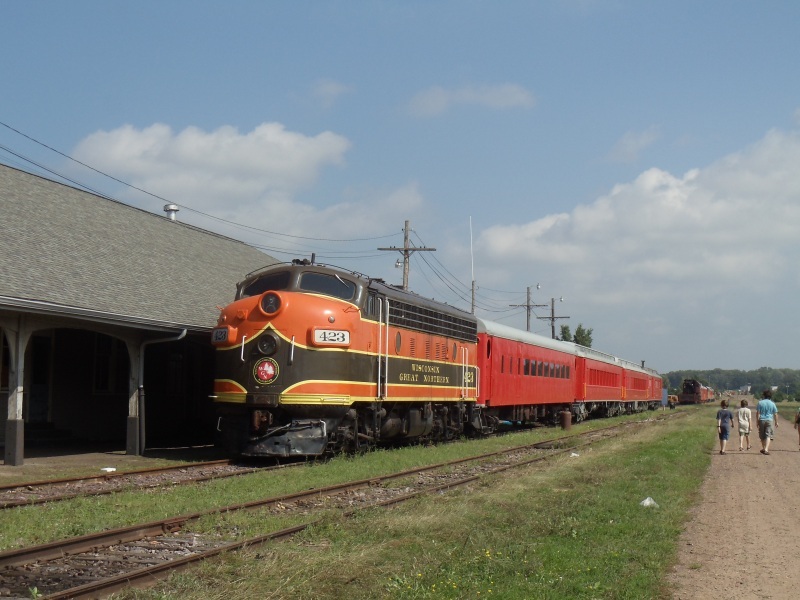 Siren is a significant stop along the Gandy Dancer State Trail, a rail-to-trail that runs from St. Croix Falls all the way up to Superior – with some ducking into Minnesota along the way. “Gandy Dancer” is named for 1800s railroad workers and the songs and chants they occupied themselves with while they worked what were very tough jobs. Siren is flanked by lakes and has bounced back nicely after suffering major damage from a 2001 tornado. Highway 70 joins up with Highway 35 in Siren, following it north for a few miles before heading east again to Spooner (pop. 2,653, and believe it or not, the largest city along Highway 70.) Spooner calls itself “Crossroads of the North”, and with Highway 70, U.S. 53 and U.S. 63 all meeting there and the city being the center of much activity, it basically is. On the west side of town is the World’s Largest Muskie Hatchery in the form of the Tommy G. Thompson State Fish Hatchery (951 W. Maple, 715-635-4147.) Spooner wasn’t always just a significant crossroads town for highways; it was a big railroad town, once the home of the Omaha Railroad Line. 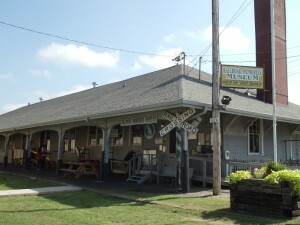 This heritage lives on with the Railroad Memories Museum on Front Street (715-635-3325), inside the original train station – which was built in 1902. 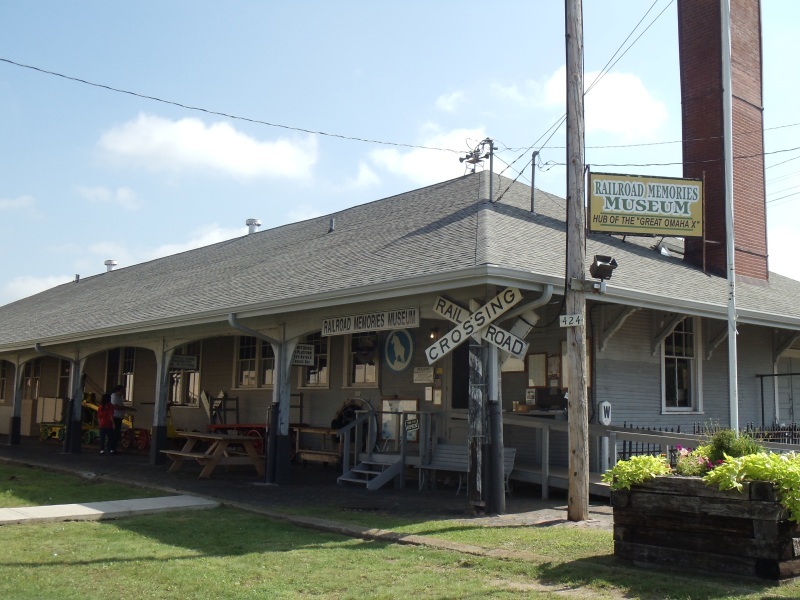 Ten rooms of rail memorabilia, with each room depicting a different facet of the railroad industry. The former main rail line lives on as the Wild River State Trail, a nearly 100-mile long recreational trail – of which Spooner is a major stop. 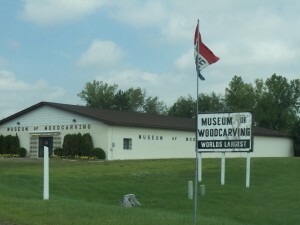 Other museums in Spooner include the new Wisconsin Canoe Heritage Museum (312 N. Front Street) and the nearby Museum of Woodcarving (five miles south on U.S. 63 in Shell Lake, 715-468-7100). 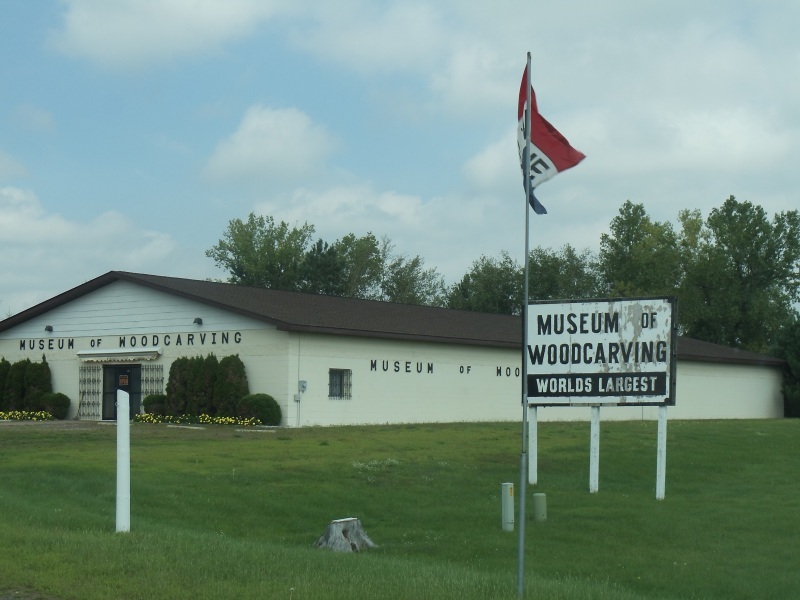 The Museum of Woodcarving features incredible works from Joseph Barta, who retired from teaching in Spooner so he could dedicate his life to woodcarving. More than 100 life-size and 400 miniature carvings are on display, including a follow-the-story depiction of the life of Jesus Christ. 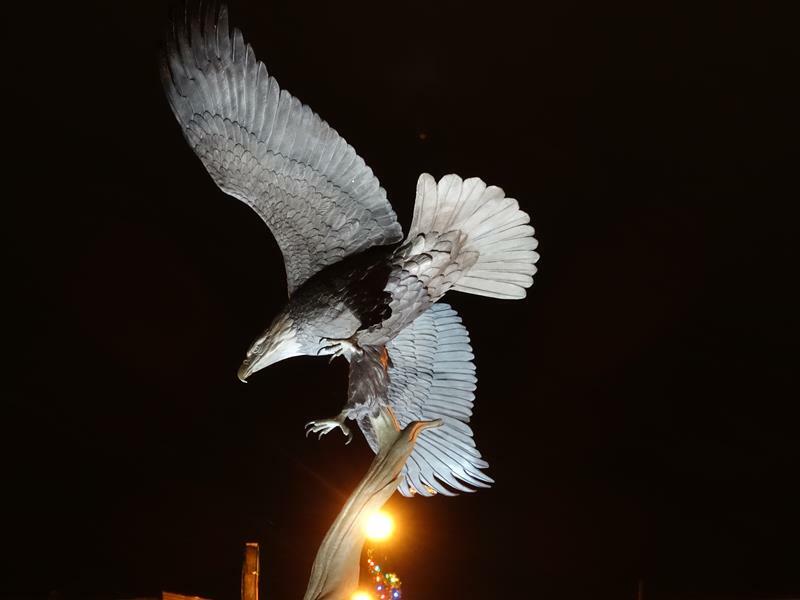 Like Siren, Spooner hosts a number of annual festivals that draw people from around the region, including the Heart of the North Rodeo and Jack Pine Savage Days. 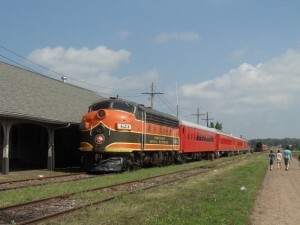 The Railroad Memories Museum is a rail buff’s paradise. One of the original trains lurks outside, available for tours…it just looks like it’s anxious to barrel down the tracks again. 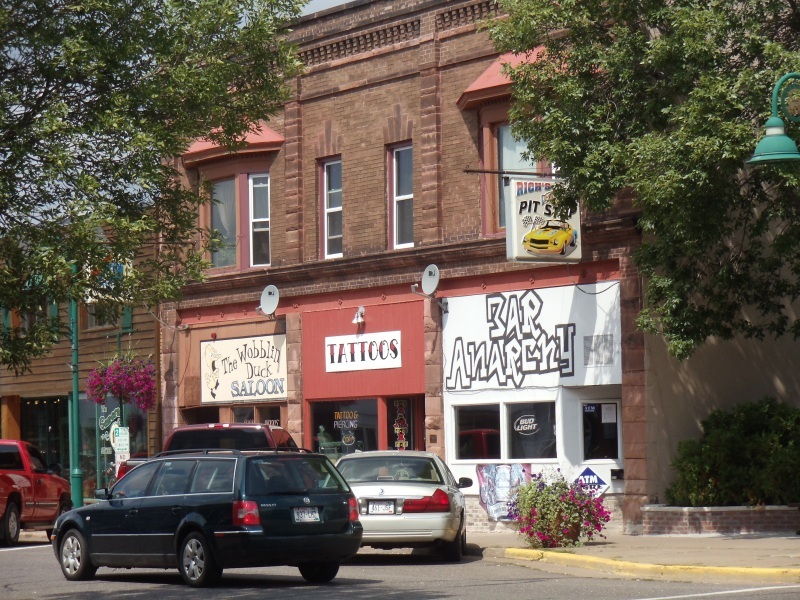 Highway 70 is Maple Street through Spooner… a main drive to be sure, but the actual downtown area of Spooner is several blocks north. If you follow U.S. 63 (River Street) north, you’ll reach downtown. Straight north on Front Street, which also parallels the Wild River State Trail, you can access the main area of shops and museums. Continuing east on Highway 70, you’ll reach the intersection with the U.S. 53 freeway, the only location where Highway 70 meets with an expressway along its nearly 250 mile journey. 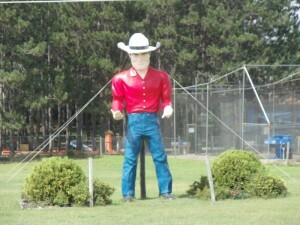 …and to the north via U.S. 63 just on the north side of Spooner, you can get a kick out of big ol’ Cowboy Muffler Man, who today guards Bulik’s Amusement Center, which offers waterslides, mini golf and go-karts (N5639 Highway 63 North, 715-635-7111). East of Spooner and the junction with U.S. Highway 53, Highway 70 cuts through vast expanses of forest on its way to Stone Lake (pop. 544), where the forests give way to cranberry bogs around nearby Spring Lake. Stone Lake hosts a cranberry festival every October and is a gateway to a series of lakes that flank this area. Highway 27, fresh from Hayward, joins Highway 70 for the next 25 miles or so into Sawyer County and threading between a series of lakes and winding along the Couderay River, affording sometimes brief but always lovely views. Starting at the 27/70 junction to run along lovely Sand Lake, which despite the name consists primarily of water. The kind of scenery along Highway 27 between Hayward and Radisson. Following Highway 27 & 70 means winding along a series of lakes and rivers, affording sometimes brief but always lovely views. The scenery here appeals to everyone, even old Chicago gangsters like Al Capone, who kept a hideout on Pike Lake (via County Highway CC) a few miles north of Couderay (pop. 96), a blink-of-an-eye village along the highway. 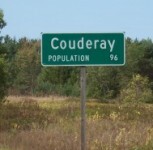 There are no retail businesses in Couderay, although there is a part-time tavern. 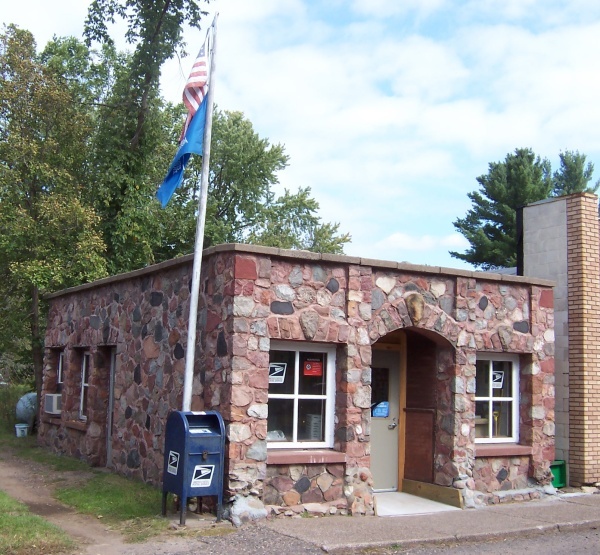 Nevertheless, it has its own post office serving the surrounding area (the zip is 54828, in case you were curious) and it’s one of the tiniest, charming post offices you will ever see. 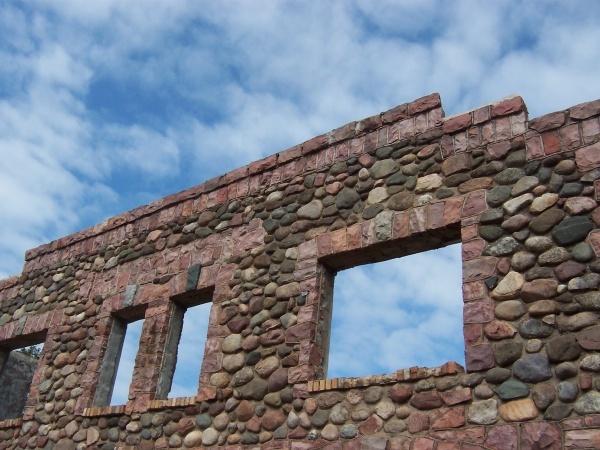 Constructed of native stones, it’s located next to what at the time of this writing is a wreck of a building constructed with similar materials, but is missing a roof and most of its walls. 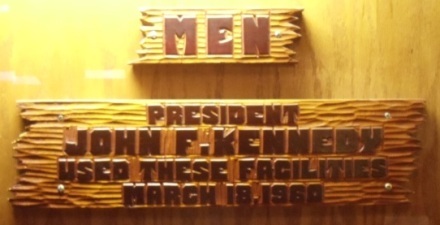 Research tells me this used to be a place called the Keystone Bar, but if anyone is positive, let us know. The coldest temperature ever in modern-day Wisconsin, an innards-chilling -55°F, was reported in Couderay on February 4, 1996. Check out Couderay’s (population 96) post office, right along Highway 27/70. Some of the adjacent buildings have since been abandoned, making for some interesting perspective shots. Further east, the northern terminus of Highway 40 crosses your path at Radisson (pop. 222 and ironically, there is no Radisson Hotel to be found) before the Chippewa River shoulders up to parallel your way. At Ojibwa, Highway 27 turns south and Highway 70 forges on along the Chippewa River, which offers excellent canoeing. Further east, you reach Winter (pop. 344), a village whose weather matches its name about seven months of the year. Winter celebrates its location along the Tuscobia Trail, which Highway 70 parallels – though not always closely – for much of this stretch. The Tuscobia State Trail is another of Wisconsin’s celebrated rail-to-trail routes, covering 74 miles from Tuscobia to Park Falls. Plant lovers will want to check out the Winter Greenhouse, which features over 1,000 varieties of herbaceous perennials and display gardens including a waterfall. 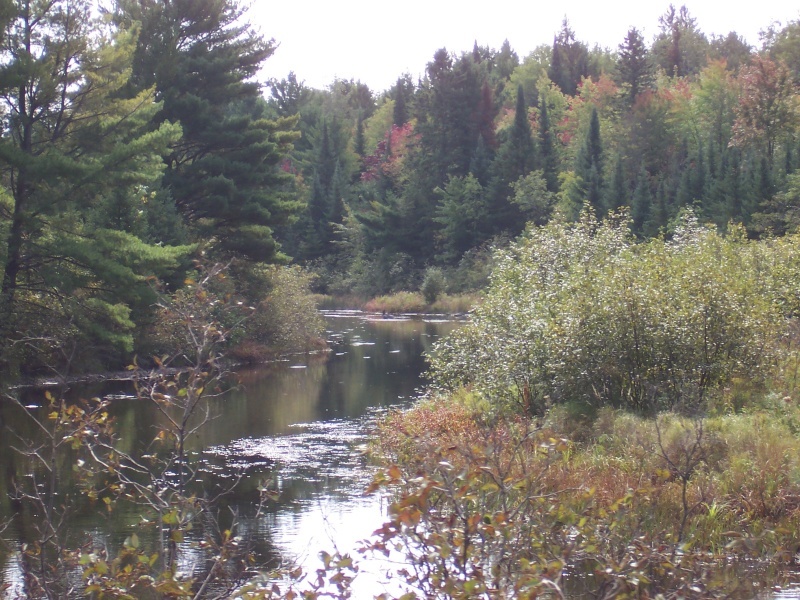 East from Winter, through Loretta and Draper, Highway 70 heads through the Flambeau River State Forest. This is a long ride filled with beautiful scenery. 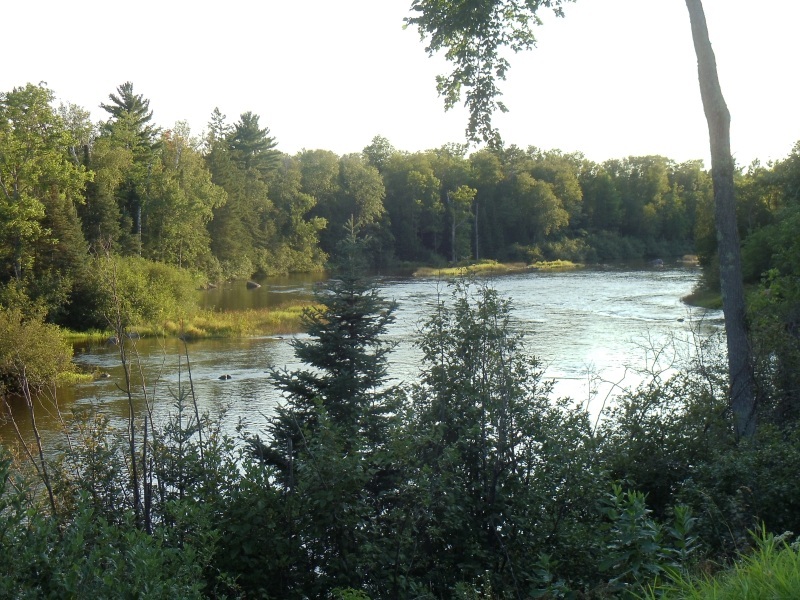 The tree-lined stretches are broken by river views, including multiple crossings of the Flambeau River. This is a terrific stretch of river with ample canoeing possiblities. Fifield (“a little town in northern WI with more cars than people”, as some of their materials say) provides a junction with Highway 13; this is the only place you can stop for gas and services for about 25 miles in either direction. 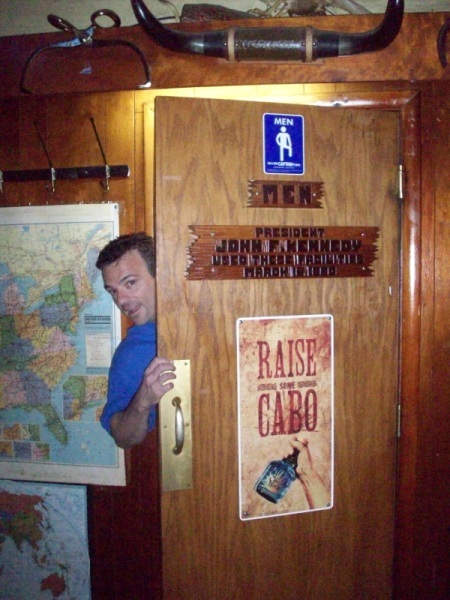 Of course, there are some taverns here and there to keep you company! From Price County, Highway 70 shaves the northwest corner of Oneida County for less than a mile before entering Vilas County and the Lac du Flambeau Reservation. 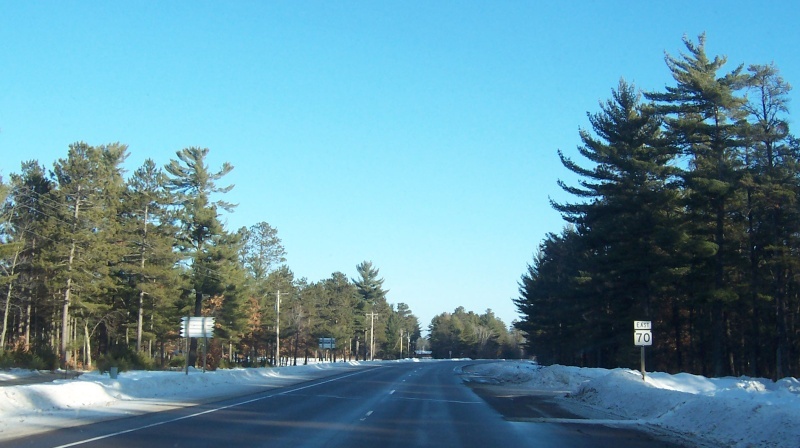 Through this area, the highway threads the needle between a number of lakes before ducking back into Oneida County and heading toward bonafide civilization as you approach Woodruff and its sister towns, Minocqua and Arbor Vitae. 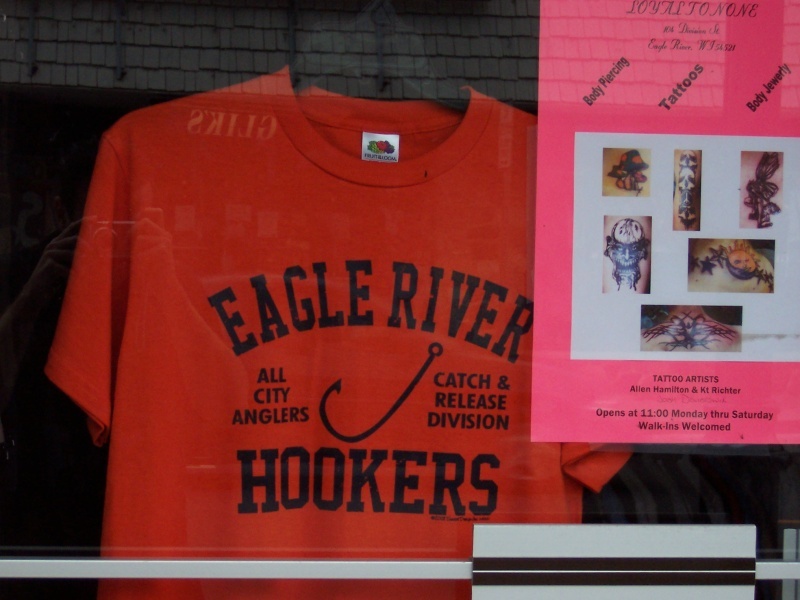 This is where you go from vacationers who primarily hunt, fish and hike to vacationers who shop and buy t-shirts. Woodruff, Minocqua and Arbor Vitae. 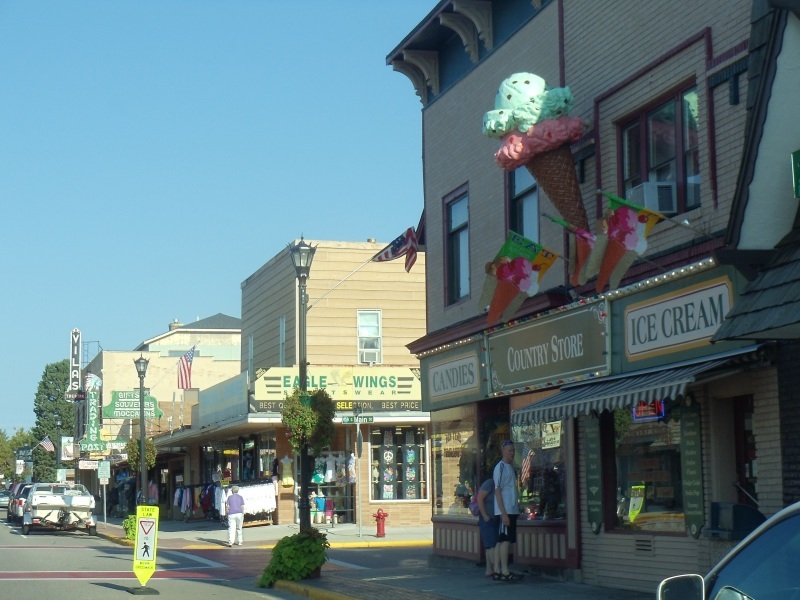 One of Wisconsin’s most frequented vacation destinations is this stretch of towns surrounded by lakes, forest, and beauty. The presence of Illinois license plates gives you the proper impression that this area is filled with shops, restaurants, t-shirt stores and throngs of families looking to rent lake homes or hang out in the resorts that dot the lakes ringing the area. Highway 70 enters Woodruff (pop. 1,982) past Jim Peck’s Wildwood Wildlife Park, the “Zoo of the Northwoods.” Over 500 animals, some of whom are roaming, will greet you. 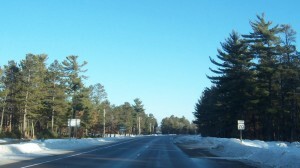 Highway 70 with U.S. 51, heading from Minocqua into Woodruff. 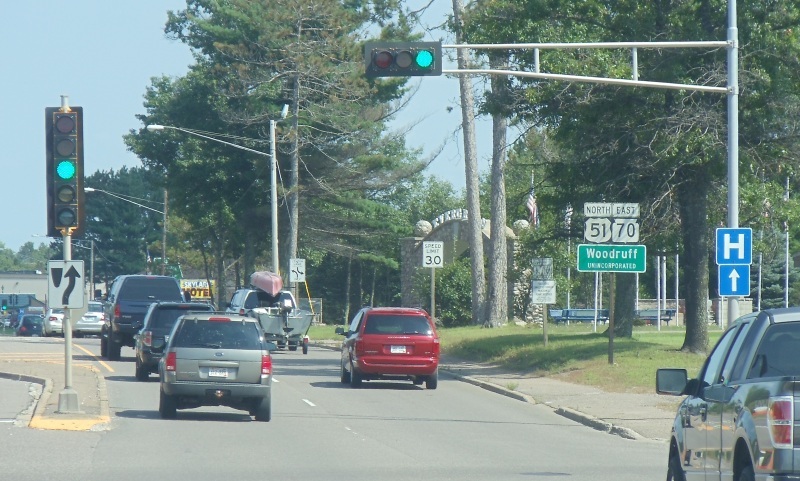 Entering Woodruff, you’ll find shopping, plenty of gas stations and even some fast-food restaurants, as well as the first traffic light for something like 100 miles – the last one was in Spooner, for cryin’ out loud! 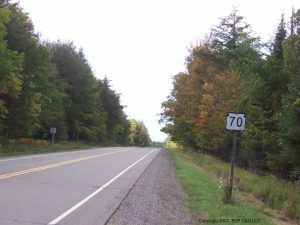 Highway 70 hooks up with the north-south backbone of Wisconsin, U.S. 51, which is the main drag through Minocqua and Woodruff. Minocqua lies to the south along U.S. 51. Highway 70 follows northbound for several miles, which includes a crossing with Highway 47. This stretch can be bumper-to-bumper on warm summer days – and some nights, too. 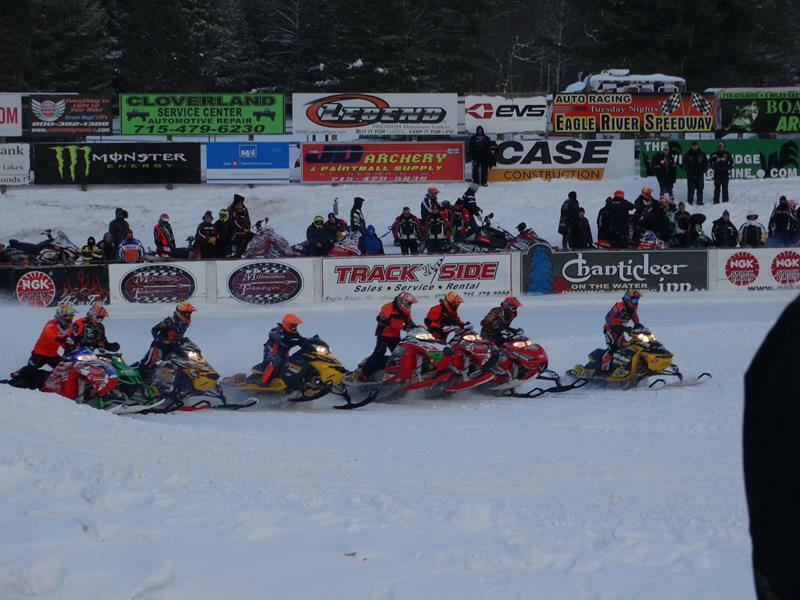 Within a short distance of Minocqua-Woodruff-Arbor Vitae are over 1,600 miles of professionally groomed snowmobile trails amidst 1,300 glacial lakes and 233,000 acres of public forest lands. 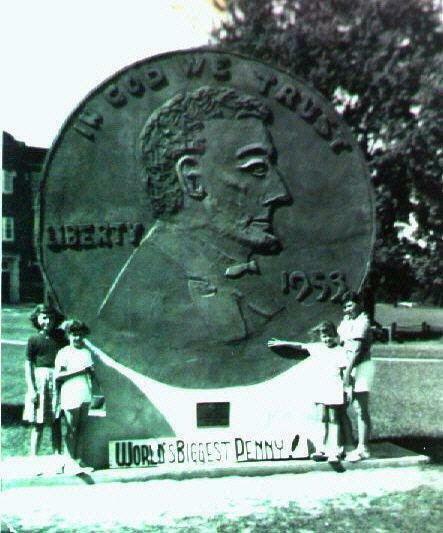 Also in Woodruff, you’ll find the World’s Largest Penny. Located just west of Highway 70/U.S. 51 at 923 Second Avenue, it came about from a fund-raising effort by Dr. Kate Pelham Newcomb (a.k.a. the “Angel on Snowshoes” in these parts). In the early 1950s, Woodruff needed a hospital. Dr. Kate encouraged area children to save their pennies, a story that spread around the nation. 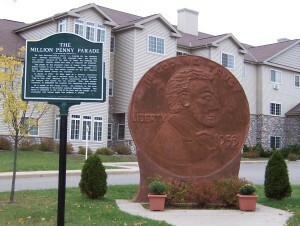 Pennies poured in from all over the U.S., and eventually 1.7 million of them helped get the hospital built. Apparently health care was a lot less expensive back then. Ironically, the schoolkids from 1953 (the year stamped on the penny) will soon approach the age where some may enter the assisted living facility behind it. So how’s this for cool? State Trunk Tour fan Agnes W. sent in this picture of her (she’s on the left) and her siblings the year the penny was dedicated in 1953. Thanks, Agnes! Rolling through the North Woods between Woodruff/Arbor Vitae and St. Germain, into the heart of snowmobileland – if that’s a word. If you love fishing, hiking, biking and snowmobiling, though, it pretty much is. St. Germain brags that it has some of the cleanest water in the world – probably because it does. While there are plenty of lakes allowing all kinds of boats, some are designed “no motorized boats allowed”, making for great swimming beaches. Um, in the summer. 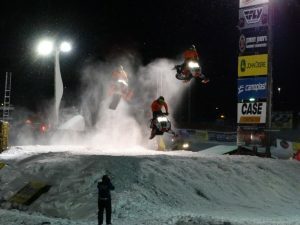 In the winter, they pull out the snowmobiles. 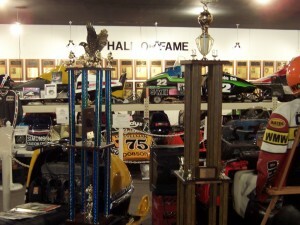 So much so that the Snowmobile Hall of Fame and Museum (8481 Hwy. 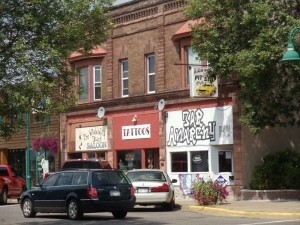 70, 715-542-4477) is in St. Germain, having moved here from Eagle River in 1993. 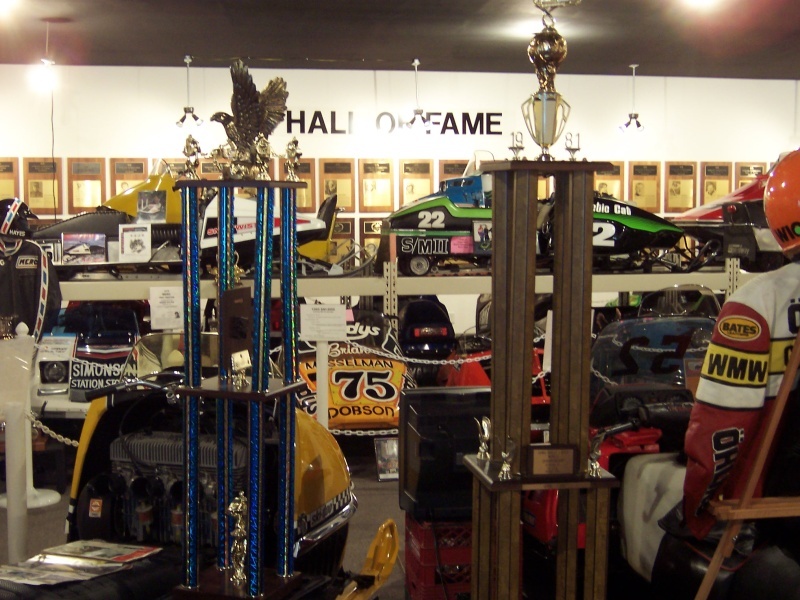 They underwent expansions in 2005 and 2015 and today house a wide variety of snowmobiles and salutes to racing champions. 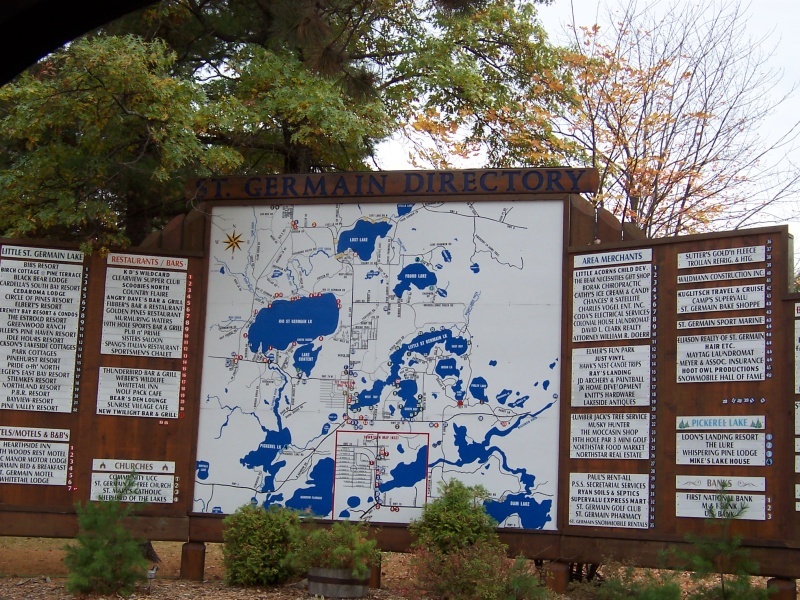 Like a massive “You Are Here” map, this directory in the heart of St. Germain shows you where things are, and also illustrates clearly just how many lakes are around here. Highway 70 intersects with the southern start of Highway 155 here, a short seven mile spur to Sayner (nice alliteration, no?) 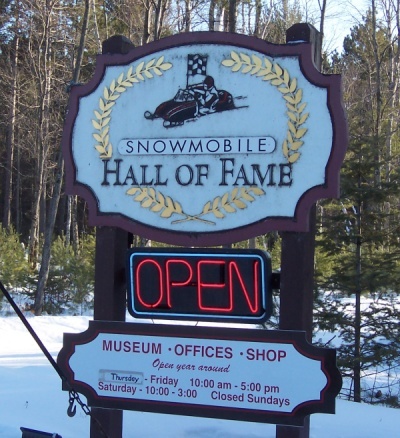 that brings you to the museum where the snowmobile was invented! The drive from St. Germain to Eagle River is beautiful any time of year, but during fall colors is especially striking. 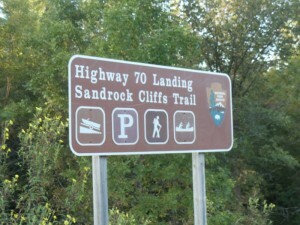 The Wisconsin River, early on in its journey toward the Mississippi, is often right by the roadside on this stretch of Highway 70. The “Hardest Working River in the World”, as the Wisconsin is called, is still in its infancy here. It’s great for canoeing at this point, so try Hawk’s Nest Canoe Outfitters (715-542-2300) and spend some time floating down to the Rainbow Flowage. They’re located right along Highway 70 east of St. Germain. 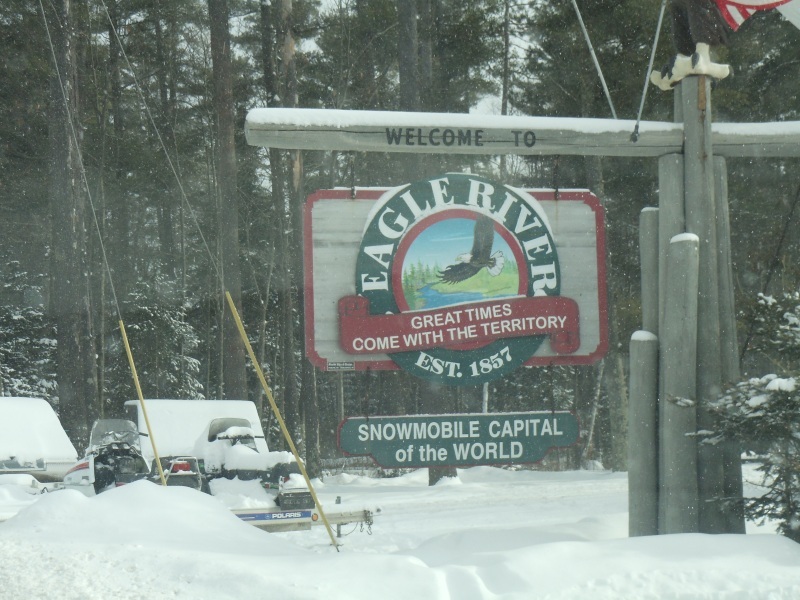 After Highway 17 comes in from Rhinelander and joins Highway 70, you get into Eagle River (pop. 1,443), one of Wisconsin’s most popular vacation towns. It’s nicknamed the “Snowmobiling Capital of the World“, and competitions are held here throughout the winter months. 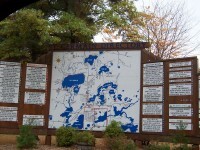 Extensive trails stretch for miles from the town and around the multitude of lakes in the area. In warmer months, boating is very popular on these lakes… so many area lakes (28), in fact, that the Eagle River/Three Lakes Chain compose the largest number of interconnected lakes in the world. 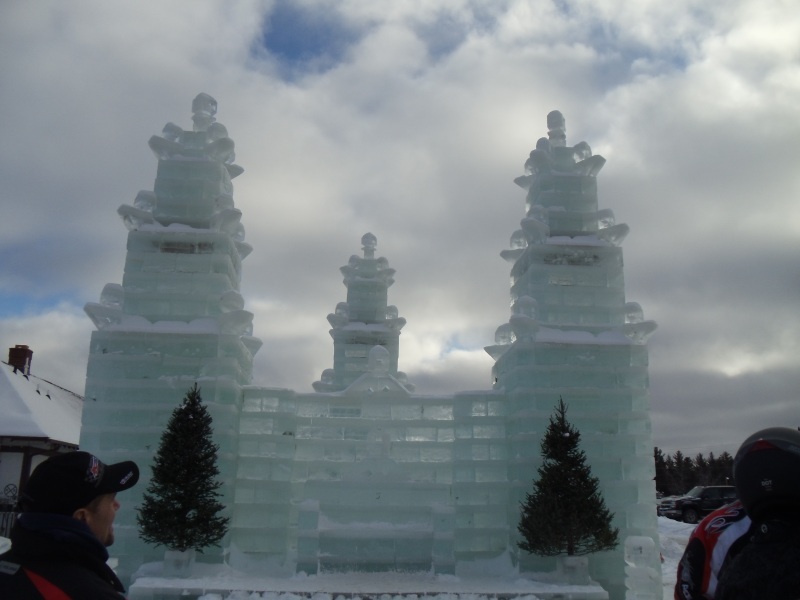 These lakes are frozen a good chunk of the year, obviously, and on the weekend closest to New Years’, area firefighters and volunteers cut 3,000 foot-thick blocks of ice from nearby Silver Lake to build the Ice Palace. The Ice Palace has been constructed almost annually since the 1920s and usually stands about 20 feet high, lit up at night with a multitude of colors. Tourists are welcome to check it out and take pictures; just don’t build a fire nearby or chip off any ice for your beverage. Highway 70 through town is also joined by U.S. 45 and Highway 32. Restaurants and motels line the route, and Wall Street – one block north through the heart of town – is where most of the action is. Lining the Wall are shops, confectioneries, bars, restaurants and the Vilas Theater, a five-screen cinema that dates back many decades. 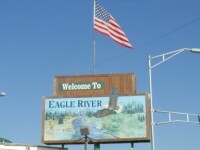 Eagle River is named after the – you guessed it – Eagle River, which flows out of the Chain O’Lakes and into the Wisconsin River. The Wisconsin’s source in Lac Vieux Desert is only about 15 miles north along the Wisconsin-Michigan border, and it’s still pretty small as it flows past Eagle River. Of course, it gains significant size and strength as it flows nearly 400 miles and drops over 1,000 feet on its way to the Mississippi! 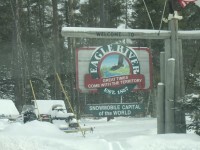 East of Eagle River, services are few and forest is all encompassing. The drive is beautiful – especially during the fall color season – and don’t be surprised to find wild turkeys congregating along the roadside (interestingly, their numbers seem to thin out during November). Occasional establishments pop up along Highway 70, including Bogart’s Oasis, which might have the only HDTV set between Eagle River and Florence. I could see a football game from the road through the front door. Further east, you cross Highway 55 and Highway 139; all other intersections are small forest roads, since this area traverses the Nicolet National Forest. Even with few cross streets, every 10 miles or so you’re reminded you’re on Highway 70. 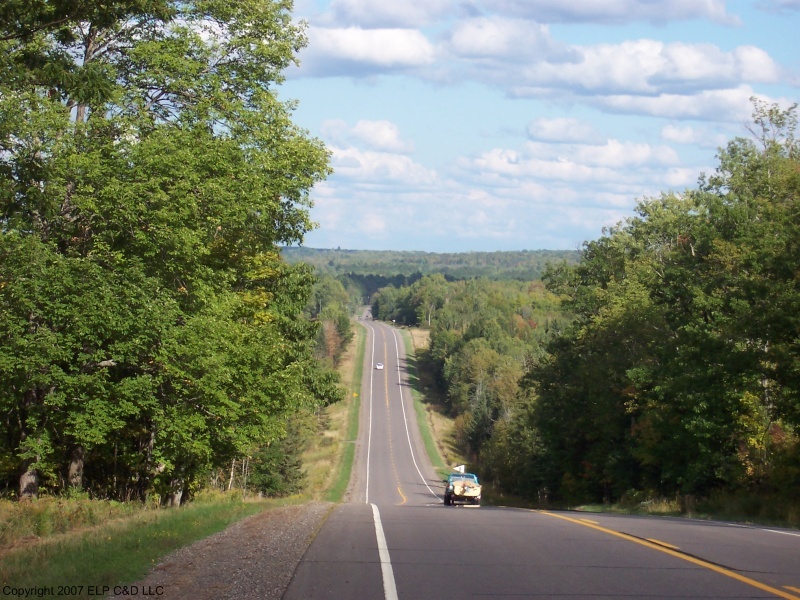 Trees solidly line the roadway in this area, which is part of the Nicolet National Forest. High points along Highway 70 provide a view of miles across the forest; this shot looks toward Florence, with Upper Michigan in the distance. 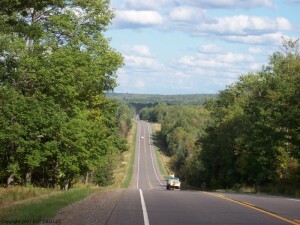 Highway 139, a minor state trunk highway which Highway 70 joins briefly, connects north across the Brule River to the Upper Peninsula of Michigan and Iron River, and south to Long Lake and, further down, U.S. 8. This is all in the midst of the Nicolet National Forest and some of the best hiking, camping and ATVing in the Midwest. You can find lists of trails, from snowmobiling to ATVing to waterfall hiking trails and more, on the Florence County website. 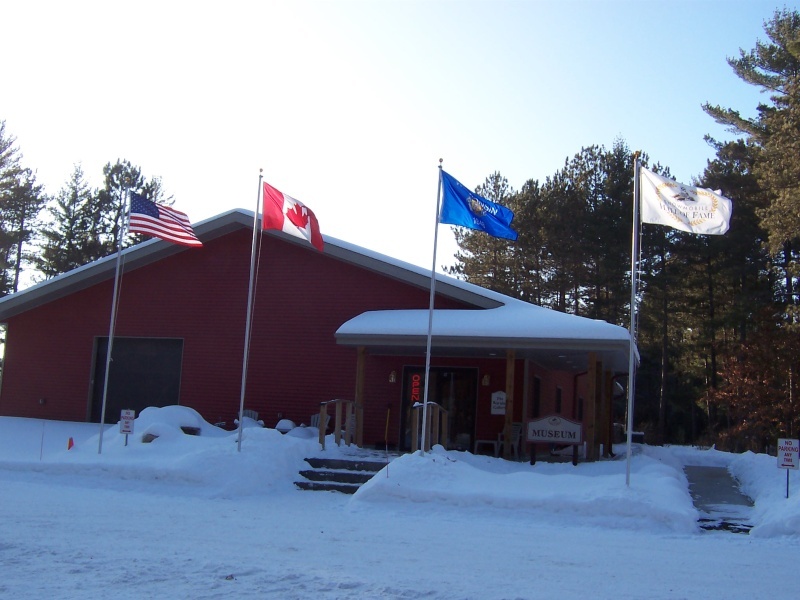 As you head out of the Nicolet National Forest, Highway 101 meets up from its rural run through forest land and some hilly areas, as it connects to the Keyes Park Ski Hill. While not a major skiing destination, it does offer a 230 foot vertical drop as part of its 5-trail system, which also features a 450-foot run. The end of the line for Highway 70 (with Highway 101 in tow, having joined just a few miles back) is at the western edge of Florence (pop. 2,319), county seat of Florence County and the only unincorporated county seat in Wisconsin. That doesn’t stop the area from having the largest ATV and snowmobile trail system in the state; this place is a haven for those loving the outdoors. 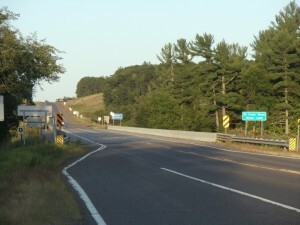 Highway 70 – with 101 – comes to an end at U.S. 2 & 141 during their dip back into Wisconsin from the U.P. 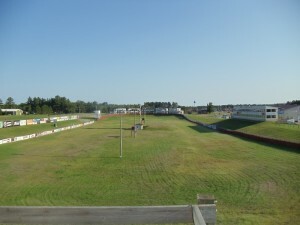 on the western edge of the Town of Florence. From Florence, you can head north into the U.P. 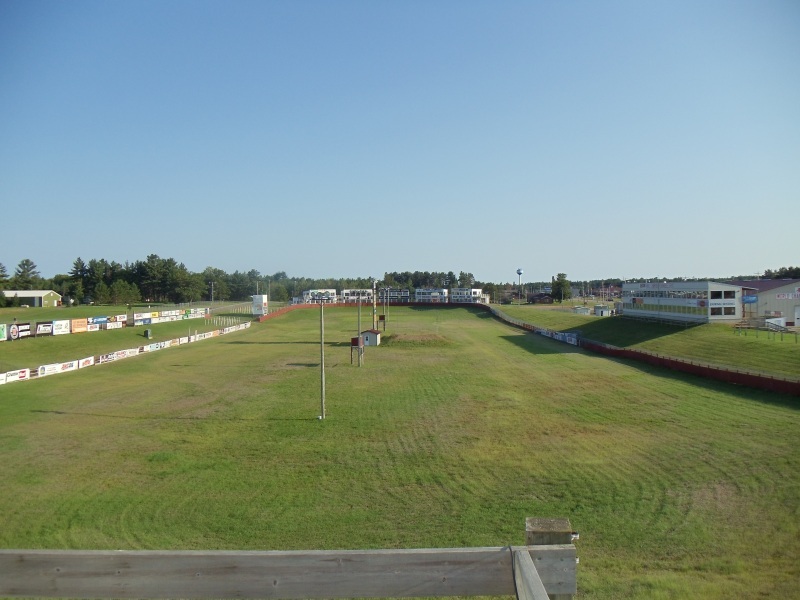 if you so desire, or head east into Florence. 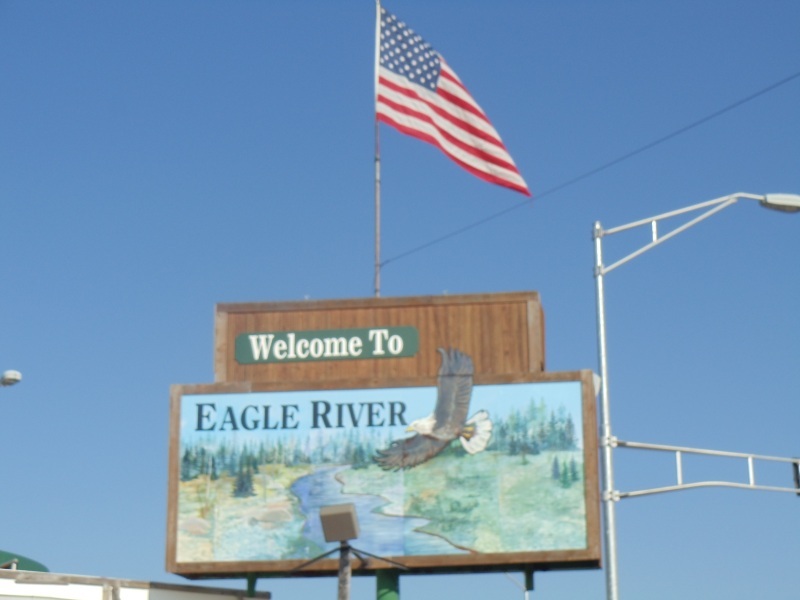 The town features the Wild Rivers Interpretive Center, which does everything from offer exhibits on the rivers and how logging and mining towns developed and continue to walking trails and facilities for RVs and dog owners whose pooches need a little exercise and sniff time. Just beyond Florence you can check the eyebrow-raising settlement of Spread Eagle, which doesn’t spread too far but does offer the 7,400-acre Spread Eagle Barrens State Natural Area (715-528-5377), which was designated in 1995 to protect an extensive landscape of bracken grassland and barrens dominated by scattered jack pine, red pine, scrub oak, and quaking aspen, all bisected by the wild-flowing Pine River. The Area offers wildlife viewing, fishing, hunting, trapping, and even berry-picking – in season. The Barrens is open from April through December. U.S. 141 south will head back into Michigan, but then back into Wisconsin so you can check out Niagara and Marinette County with all of its waterfalls and scenic beauty – plus access back to the rest of the state! Can connect nearby to: Ah, that’s about it up here. Well done highlights of various towns/areas along the route. Photos are good.